By far one of my favourite Ubud dining spots, this laid back café off Hanoman is mostly known for it’s vegetarian nasi campur, albeit with a strong Japanese influence. It lacks the pretentiousness of some of Ubud’s nearby veggie spots, a strong plus for this classless food buff, and it’s a great place to idly pass time either people-watching or with your nose shoved in a book. The original Sopa restaurant is located in Madrid. While the nasi campur is probably the restaurant’s hit dish, the rest of the menu isn’t to be ignored. 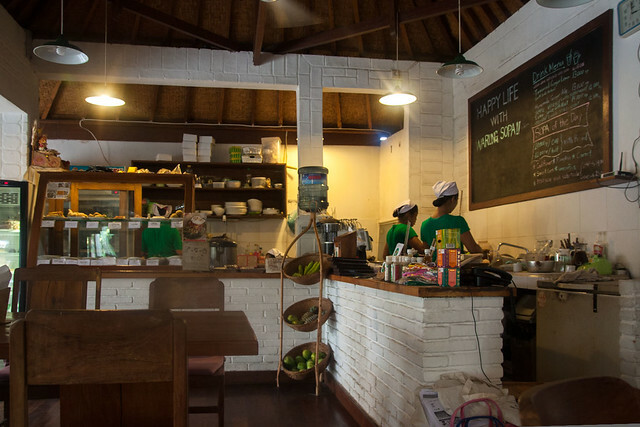 For a taste of Western home comforts there are soup and pasta dishes, and the cake and pie cabinet stands without competition in the rest of Ubud (nearly all are vegan). Sopa also sells their own home made miso paste and, if you’re lucky and it’s in stock, natto in ginger juice with soy sauce. 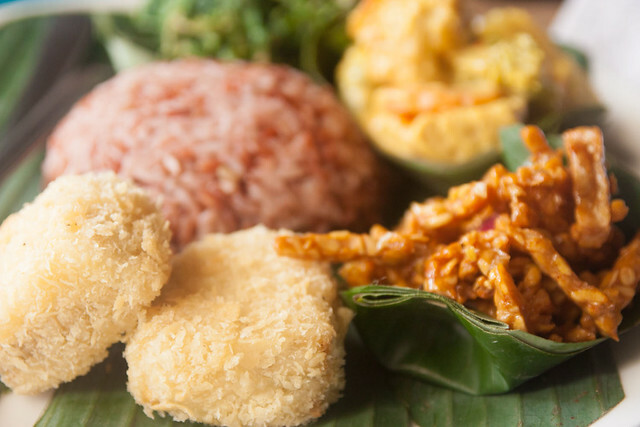 Nasi campur, for the uninitiated, is essentially a rice dish served with a selection of sides. Sometimes the vendor will have a variety from which to choose and other times the selection is set, but either way it’s a great way to sample lots of different dishes. It would be easy to call Sopa’s version a variation on tradition due to its inclusion of dishes from across the globe, but then there is no such thing as a right or correct nasi campur. No two are the same, and you will find fluctuation in this national dish at any warung, street stall, or restaurant across the country. Banana flower salad: soft slices of banana blossom in a mild coconut dressing with lots of garlic. Tempe manis: sweet, crunchy tempeh. See my recipe here. Samosa: a bit bland in my opinion, and in need of salt, but it sure was nice to have pastry! Eggplant: a simple but tasty mild curry dish. I liked it, but wished the aubergine was more cooked. Tofu falafel: One of my favourites, this was less like falafel then what I’d imagine a ball of fried feta to taste like. The inside was stuffed with herbs (predominantly Italian basil). Tofu miso balls: Another favourite, these consisted of miso sandwiched between two pieces of breaded tofu. Greens in kinako sauce: Smooth, creamy okara and cooked greens with a rich miso flavour. Served with fresh tomato. 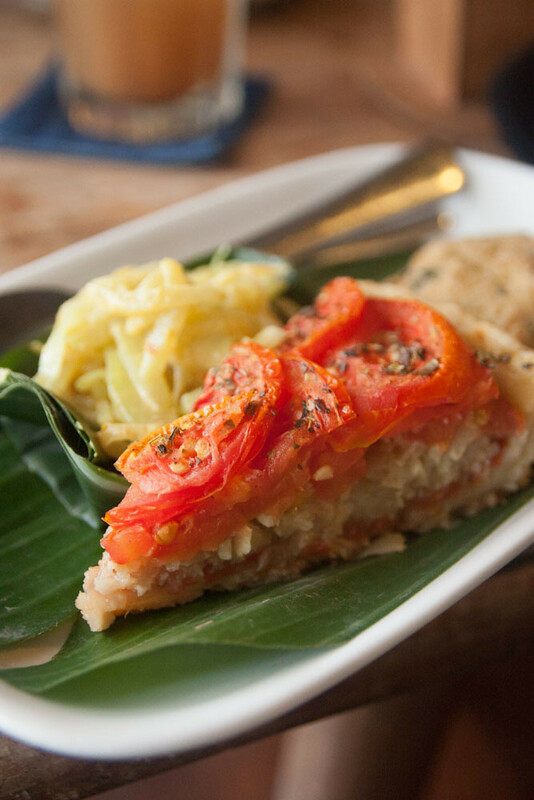 Vegan tomato quiche: fresh and light, this treat seems to sell out quickly. I should also mention the nasi campur is served with sambals, a typical accompaniment, should you wish to set your food on fire before consuming. 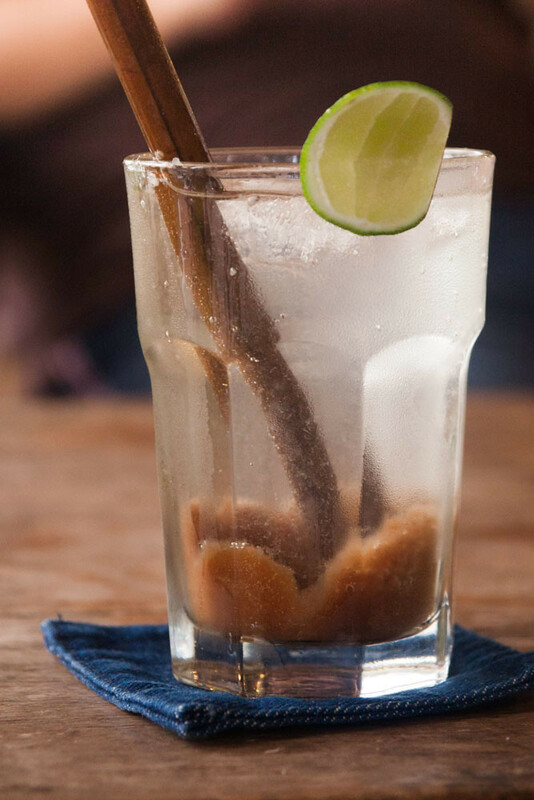 The tamarind, ginger, and lemon soda is served alongside a slice of lime and a small jug of simple sugar syrup, a great way to let customers choose how sweet they want their drink. This refreshing bevvie has got to be made into a cocktail. Enough said. Snake fruit, or salak, is a starchy apple-like fruit commonly found throughout Southeast Asia. The skin of this fruit resembles that of a snake, hence its name, but get past the spooky exterior and you’ll experience a flavour not completely dissimilar to apple, but with a jasmine and pineapple undertone. 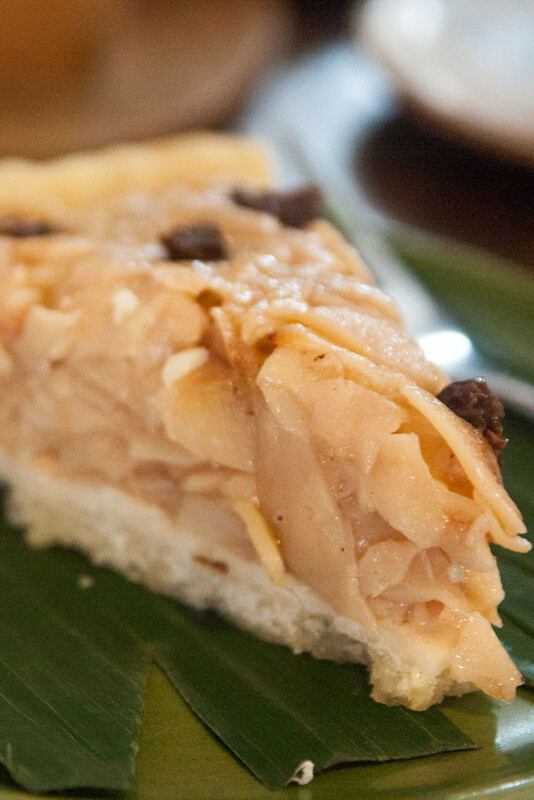 Warung Sopa’s snake fruit pie reminded me of a crunchy apple pie, comfort food on a hot Bali afternoon. Try the pie, but to really experience the fruit you must consume it fresh. I think I ate more meals at Warung Sopa than at any other establishment in Ubud (maybe equal with Bali Vegan Warung), and with good reason. It’s a comfortable environment with quality food and a welcoming atmosphere. The selection of food is varied, and the employees will happily discuss ingredients with you if you are unsure of the veganness of an item.